Convicted for life for his role in the 1984 anti-Sikh riots, Kishori Lal, whose crime gave him the sobriquet 'Butcher of Trilokpuri', might have convinced the Tihar Jail authorities of his reformation but the victims think otherwise. The gathering storm of protests against his proposed release—a decision that has now been reversed—is a testimony to the sense of injustice suffered by the Sikh community. The protests took a political turn today with members of the BJP and Shiromani Akali Dal clashing with the police outside residence of Delhi Chief Minister Sheila Dikshit. The damage caused by Lt Governor Tejendra Khanna’s earlier decision to commute Lal’s life sentences has resulted in demands today for a review of the Supreme Court’s decision to commute the death sentences awarded to Lal to life terms. Following protests by the Sikh community, the Lt Governor had on Monday sent Lal’s case back to the State Review Board—headed by the chief minister—which had forwarded Lal’s case after Tihar Jail authorities had recommended the commuting of his life sentences on the basis of his 'good conduct'. Lal was accused of stabbing people in his neighbourhood in East Delhi – which witnessed some of the worst cases of rioting in the aftermath of the assassination of then prime minister Indira Gandhi. Survivors and eyewitnesses tell of horror stories of how mobs led by Lal went on a rampage in Trilokpuri for three days. There are allegations of mobs led by Lal having killed more than 80 people during the riots. While Lal was sentenced to death in at least five cases by the lower courts, the Supreme Court had commuted the death sentences to life sentences. 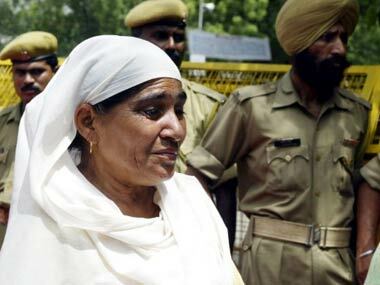 Lal was among the 25 people convicted in the 1984 riots and has spent 16 years in prison.